EVERY AIRCRAFT should be flown by the NUMBERS, but especially an airplane as aerodynamically clean and one that has the greatest power off glide ratio in the business and in some instances, more than double the glide of others in its class. As you probably know, EVERYTHING in aviation is a trade-off. Fly along happily when all goes quiet and then what? You’d better hope that you’re in a Mooney should that ever happen because under most conditions beyond take off, the Mooney will give you precious time to locate a landing zone of your choice and due to that marvelous steel “roll cage”, it will protect you many times better than the average “beer can” construction of the other brands that fold up on impact. The DOWNSIDE is that the MOONEY does not want to quit flying, which can translate to FLOATING if you carry too much SPEED. WHAT WORKS? Well, on the earlier Mooneys such as M20-A-J, I always suggest flying the pattern at 100 mph downwind, 90 mph on base, 80 mph on final, and 70-75 mph over the numbers. On the heavier models say from the 231 on up, I would add about 5 mph to those numbers, but what you will find is that all Mooneys are somewhat different, probably due to being all hand crafted, so use these numbers as a beginning guideline and you’ve got the main part of the landing phase nailed. IS IT REALLY THAT SIMPLE? NO. :o) There is more involved, not the least of which is practice, so let’s get in to that some. ABOUT 95% of the instructors I observe teaching or checking pilots out in my opinion tend to fly the pattern way too tight and I personally see that as a safety issue to the negative for a couple of reasons. Hmmmmmm…. Engine failures are way more rare than stall spin accidents in the base to final phase of flight and I will take my chances on the engine not quitting to be safer in the “real world”. A wider pattern first off will help keep you from overtaking the painstakingly slow Cessna 150′s in the pattern which if you pay attention, those are mostly flown in a very tight pattern as taught by the instructor. It is near impossible to see a Cessna 150 when over-taking it in the pattern or elsewhere for that matter, in fact it looks like the “crosshairs” of a gun sight when over-taking from behind. Not easy to see. Oh, you say, but you can hear him on the radio and know his position……………can’t you? Not always because few pilots I fly in patterns know how to properly handle the radio and a good many don’t even use it at all at uncontrolled fields! 1. Flying a wider pattern will keep you from over-taking a great many slower, hard to see from behind aircraft in the pattern. 2. Flying a wider pattern will give you plenty of time to make leisurely turns at STANDARD RATE!!! Most of the pilots that fly with me will hear me tell them to keep their pattern turns at STANDARD RATE, and I will drive that point home until my voice runs out. Sucking in the runway on downwind, especially in a higher performance airplane such as the Mooney causes one to rush turns and that can lead to disaster, and I mean disaster! You are on the west side of the field on downwind flying a close pattern. You turn your base and the winds aloft is out of the west. What happens then? Well, that west wind will push you as a tail wind on base will it not?, and you’re already close to the runway, so in order to save the landing, you have to bank your plane’s tail feathers off in order to make final lined up with the funway (runway). With a tail wind on base, you barely have time to dial in all the flaps you need let alone lining yourself up with properly with the runway, so your nose is a bit higher than it would be if you had full flaps deployed at that point, so picture this: You are over-shooting the runway, it’s windy and therefore bumpy, your nose is too high and your bank is WAY TOO HIGH. WHAT HAPPENS TO STALL SPEED IN A STEEP BANK? STEEP BANK; STEEP STALL SPEED! You then hit a wind gust, your airplane stalls, you flip over the opposite way and then head straight down, BANG CRASH SMOKING HOLE end of STORY! Another stall/spin statistic, aren’t’ you? They don’t call the base to final turn the “SUICIDE” turn for nothing! SO, flying a wider pattern in a high performing airplane equates to safety, comfort, and not placing the airplane and its contents in jeopardy. DO THE MATH! UPDATE: As of October 2007, there have been a ten year all too many stall/spin accidents (mostly in the pattern) which almost always takes place in the pattern and more often than not in the base to final phase of flight. The ten year total of all Gen Av stall/spins is 404. That is about 40 of these needless fatalities per year. Of the ten year total, only 14 of them involved Mooney aircraft, so every year there are 1.4 stall/spin accidents in Mooneys. Relatively low comparatively, but 100% more than there has to be if the patterns are simply flown correctly and not in a tight formation to the runway, but low banking leisurely turns. Good! DO IT! The object of flying your own machine is to stay alive by always placing the ODDS IN YOUR FAVOR IN ALL FLIGHT REGIMES. Now that we have established that safety fact, let’s get in to the actual landing phase of Mooney landings. ON PRE-201 MODELS, your gear down speed is a relatively slow 120 MPH. 201 gear speeds were raised to 150 MPH with the 1977 model and that helped the slick Mooney-Birds a lot, so let’s assume that you fly one of the early 120 MPH models and the rest of you can interpolate based on your higher gear down speeds. It’s just easier with the later models; (there are more 120 MPH gear down speed Mooneys out there than all of the later ones combined). LET US BEGIN WITH THE DESCENT for landing and let us assume you are not flying a turbocharged model such as the 231 for now, but even then this can apply in principle, but with a varying power setting. YOU the PILOT wants to begin descent for landing. What I use as a guide is that if I am cruising at or below 6,000 feet AGL, 27 nautical miles out is a rule of thumb I use to request lower when VFR. That number just seems to work out best for me so that is what I use normally. I will trim the bird downward and I will usually allow the speed to build making up somewhat for climb time. As I descend, I monitor my manifold pressure as it will assuredly increase as you descend and of course your cruise mixture setting will lean the engine more as you lower your altitude due to thicker air, so you will want to monitor that as well and richen your mixture also as you get lower. Early Mooneys have a yellow area in cruise on the airspeed indicator and if you want to fly by the book, then you will have to reduce power on descent. Do I care about the yellow area on the indicator? Not much, at least in relatively smooth air, in fact, a well rigged E model Mooney will actually cruise at 75% power in the yellow range. The reason I don’t pay that much attention to that is that the Mooney airframe will not fail you, and later models increased the “yellow area” or maximum structural speed simply by paperwork and not a strengthening of the airframe. To me, a Mooney is a Mooney and they’re built like unbreakable tanks anyway. One time I was descending in to Charlottesville Airport in Virginia in my first Mooney, a1965 E model, where the area is like a salad bowl surrounded by mountains, so a spiraling type descent was necessary. Visibility sucked as usual like it does there in the summer due to haze and I had my eye on the airport the whole time when I decided to scan my instruments. Redline in early Mooney’s is 189 MPH. My airspeed indicator was pegged way beyond 189 MPH, an estimated 200+ MPH coming downhill in a spiral type approach. What happened? I’m still here aren’t I? While I don’t condone in the least busting redline, but the beauty of the Mooney is that if you ever find yourself in that situation, chances are you’ll live to fly another day. Try that in a Bonanza, and you may well be a statistic! Anyhow, keep your eyes on your speed and attempt to keep things in the green when at all possible. NOW, as you get lower, you need to slow that Mooney down. What do many pilots I fly with do? Well, they keep reducing manifold pressure with the throttle and pay little attention to the RPM. HELLO!!! Ever heard of SHOCK COOLING? It can happen depending on whom you ask, but my experience has shown that an already weak cylinder can and will crack when cooling it off too quickly. LET ME ASK YOU THIS: Do you know what happens to the manifold pressure when you reduce RPM? It rises! WHY DOES IT RISE ZEF? Well, it rises because you have angled your propeller effectively making it more of a PADDLE in the air causing more resistance and thus making the engine work harder in order to allow that courser pitched prop beat the air in to submission. And, what does it take in order to push that coarse pitched prop through the air? POWER! What does POWER equate to? ENGINE HEAT! Is ENGINE HEAT a good thing? You betcha, when you’re coming downhill it is. Heat will stop your engine from super cooling. Duh, right? When I need to slow down, I will reduce my manifold pressure down to around 17″ initially, and then reduce my RPM to around 1900. When reducing the RPM, the manifold pressure will begin to climb as we have discussed, and when equalized, you will see something like 19-19.5 squared. An old trusted friend and original Mooney Guru; Charlie Dugosh once told me that no matter what, in a normally aspirated (non turbo) Mooney, you can be at full power, but if you don’t reduce your manifold pressure initially to below 18″, you cannot shock cool the engine no matter what speed nor attitude. I trusted my old friend Charlie and have used that advice as a rule of thumb in my Mooney flying experience including those I have personally owned and operated, and I never did crack nor fry a cylinder, so I can pass that on to you. When descending in a Mooney and you want to slow down; don’t just pull back on the throttle, REDUCE THAT RPM!!! 19-19.5 squared will keep you out of engine/prop redline setting in ALL non turbo MOONEYS! In fact, that is a great cruise speed setting in early Mooneys for just boring holes in the sky. At that cruise setting you will burn about 5.5 GPH in original M20 body, cruise near 120 MPH and do it all at Cessna 150 fuel burn and at Cessna 172 75% cruise speeds! At 52 gallons usable as in most original M20 bodies, you’re flying for near ten hours endurance before becoming a glider. (Gotta love any airplane that gives you the speed/fuel burn choices of the Mooney!) Only the Mooney will do that and then cruise at or near 155+ ktas at 75%! Hell, I’ve flown some Modified E models that easily made 165 ktas on 9 GPH! So, here we come barreling downhill. Make our power and mixture settings as needed. In early Mooneys with the 120 gear down speed, try to plan on being at pattern altitude (topography allowing) at 5 miles out so you have enough leisure time to slow that baby down to the 120. (1st stress removed). TRY to enter the pattern in any Mooney at about 100 mph, and as outlined above, keep it wide. Once in the pattern on downwind, DROP the gear and give her half flaps when within the airspeed WHITE ARC. Unlike many airplanes in our category, flaps are a good thing because that lowers the nose and helps slow you down as well. On Pipers and many Cessna’s I’ve flown, the nose goes up when flaps are extended. BAD DOG! For those of you who have electric trim, be sure to practice pulling toward you on that trim button for nose up trim at the same time you lower flaps to make the attitude change equalize. Those of you with manual trim, well you just have to pull on the yoke until you get a chance to trim to a more nose up attitude. It all works well with some practice if you are taught correctly to begin with, thus the reason for these articles. SO NOW YOU’RE ESTABLISHED IN THE PATTERN and set up initially correctly. Fly the airspeeds semi-religiously as mentioned above. Guestimate where the wind is at this point. If you have a severe crosswind, plan on not using more than half flaps in a Mooney because she sits low to the ground and ground effect can eat you up so far as “spot landings” are concerned. Again; DO NOT BANK GREATER THAN STANDARD RATE! Better to go around than to over bank and risk the stall/spin scenario. Now, once on final you should already be at full flaps and you’re slowing your bird down to at or near 80 mph, and your nose should be angled downward. Again, I find it common that the average pilot that I fly with doesn’t line up the airplane with the center line of the runway even though he thinks he is. Make a note of where you touch down each time and make it a point to make note of whether you had to do a Doce Doe in order to make the center line. If you had to do that, then your runway picture is off kilter. Fix that by making adjustments on the next approach. Remember that YOU are flying the plane and not the other way around. LEARN TO USE YOUR RUDDERS to help keep your nose where it belongs. SHORT FINAL! Remember that the Mooney probably will not touch down at the exact point you wish it to, so make slight adjustments a little at a time during practice to aim a bit short of your desired touchdown point. This is especially handy when you are operating out of short fields such as my good friend and multi-Mooney customer; Dr. Dmitri A. of Rhinebeck NY where I flew in to recently. If you overshoot that runway, you hit a huge bridge! There are as many ways to vary your approach as there are differing runways, so what I am teaching here is a guideline to go by and specific adjustments will have to be made to eventually NAIL YOUR LANDINGS. Some runways are not only short, but have obstacles which more or less require you to dive the plane toward the numbers once you’ve cleared the obstacles such as on runway 30 at Kestrel Airpark where I used to base. MOST AIRPLANES are draggier (is that a word?) than the Mooney and in those models, you can transition from glide to flare in one motion. Not so in the Mooney. In a Mooney, you normally transition from downward glide to final to level flight, and then eventually to flare. Plan on that. Fly that Mooney to a bit lower altitude than you are used to seeing in most other aircraft (save the Piper Comanche that sits just as low as the Mooney) and then level off initially to slow her down. Now, this is the transition that humbles many a Mooney pilot. If you flare too early at too high an airspeed or if the winds down the runway are somewhat gusting, a Teflon landing will be the furthest thing from what will actually occur. Ga-Boing! On the contrary, if you flare a bit too late, you can land nose wheel first at which point a porpoise is more than likely. (If you get in to a porpoise, ADD POWER and get off the ground! If enough runway exists, then begin your flare procedure again and try again, if runway length is in doubt, then GO AROUND! How do you correctly go around in a Mooney? Add only enough power to arrest your descent rate because if your trim is all the way aft as should be the case with full flap landings, it will take all of your strength to hold that yoke forward until you can get some of that nose high trim in check. Partial power, trim immediately equalized to takeoff position, flaps up to approximate takeoff position, and then add full power followed by immediate gear up once a positive climb rate is established. Zoom, you’re outta there! Go-arounds separate the the “Piano Players” from the musically illiterate. I want all of my Mooney pilots to become “Piano Players”. By that I mean that you can coordinate one hand to do one thing whilst the other is doing something else. There can be times that if you hesitate, you krash; pure and simple. It takes practice to become a true “Piano Player”. YOU become ONE, ya hear? That is your goal. SO, LET US ASSUME you’ve got that nailed. But does that alone make a good Mooney lander? Nope. There is one more very important thing on your WAY TO PERFECTION in the landing phase. Once you level off prior to flare, you are assumed to be low enough for a greaser touchdown landing. Once you’ve mastered that transition, the rest is up to you to judge just when will that Mooney actually quit flying?! This I cannot teach you. Only experience will if you are looking for those TRUE GREASERS. You will eventually feel it in the SEAT OF YOUR PANTS, and when you do; ONLY THEN IS THE TIME YOU REAR WAY BACK ON THE YOKE for the TRUE GREASER landing in a Mooney Aeroplane. Any other time, you will achieve a good landing, but we’re talking about GREASERS here at this point which is your ultimate goal. If you are just a bit too fast when you really rear back, YOU WILL BALLOON! And if you BALLOON, what do you do? Keep rearing back on the yoke until you feel the ground? NOT! You are at risk for jamming the landing gear right through your BEAUTIFUL WING! You will survive that, but your insurance company will no longer be a fan of yours. IF YOU BALLOON, and we will all do that one time or another in such an aircraft that prefers flying to not flying; YOU MUST ADD POWER and IMMEDIATELY to arrest the ascent/descent rate that can occur, and then slowly reduce power until she settles at which time you can kiss your GREASER goodbye, but at the same time, salvage the landing to one that does not damage your ego at best, or your bird at worst. SO, IN REVIEW; downhill on final followed by level flight followed by flare at just the right moment. Look, I know that on paper this sounds difficult and I certainly don’t wish to run any of you Mooney wannabe’s away, but a picture is worth 1,000 words, but words are all we have in this forum, so try to picture exactly what I’m saying here and don’t try to follow any written checklist on short final to assure your GREASERS. It’s really not that hard to get an “occasional GREASER” if you can try to picture in your mind what I’m trying to bring out here. And yes, I said OCCASIONAL! Even I (with 5,000 Mooney hours) can’t grease a Mooney every time, mostly because I fly different Mooneys near each time I fly, but even with those I’ve owned and operated many an hour, I would get to the point to where I would mostly GREASE her on, but just as I think I’ve got it nailed, even after the 5,000 Mooney hours, the Mooney shows me who is really boss and I get re-humbled; over and over again. 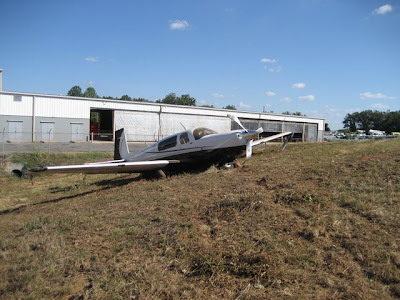 Hey, don’t think that it is difficult to make an acceptable landing in a Mooney. It is not with some practice, but again, we’re talking GREASERS here and that takes practice. YOU MUST ACKNOWLEDGE that for any landing to be acceptable, your approach to the runway plays the most important role here. It’s like spray painting. 90% of a good paint job is in the prep. Can you digget? I know that you could! Just take heed on the fact that a good landing begins on the initial descent of the aircraft followed by the PROPER SPEEDS and ATTITUDES at the PROPER TIME. IF YOU ARE A STUDENT of MOONEYLAND articles, you would already know that I had won a spot landing contest in an E model Mooney back in 1989 in my first owned Mooney, out of 35 other “non Mooney” airplanes in which they said it couldn’t’ be done! How did I nail that spot landing contest? 1. Luck 2. Planning ahead in knowing my airplane. 3. Using a trick that is good only in an semi emergency situation. Do you wanna know what that is? Okay, I’m trusting you here not to do this as a NORMAL PRACTICE, you ready? IF YOU EVER find yourself in a situation where you MUST GET YOUR MOONEY DOWN, and only then, fly to your choice of touchdown point at the proper speed, and then immediately raise your flaps! WHAT HAPPENS WHEN YOU DROP YOUR MOONEY FLAPS? Think to what happens on your takeoff upwind when you pull your flaps up, your Mooney tail drops, nose goes up, and then you climb seriously; well translate that in to landing to visualize your tail drops as it will even in landing configuration, so with the lower lift quotient as indicated when you drop the flaps, you can use that in an emergency to go ahead and retract those flaps, BUT YOU MUST IMMEDIATELY REACT with a positive pull back on your yoke because no matter what, you are going to come on down! I DO NOT recommend this as a normal practice, but when you need to PLANT YOUR MOONEY ASAP, the best way of doing that is to DROP YOUR FLAPS and then rear back on the yoke because you’re coming down no matter what, and that’s HOW I WON THE SPOT LANDING CONTEST in 1989! I must caution you that flying is about proper decision making, and if you try this maneuver after most of the runway is already behind you, then you have made the wrong decision. You should have gone around by then. I HAVE WRITTEN this ARTICLE in hopes not to make you think that you have mastered the ART OF LANDING an aircraft; most specifically the MOONEY; but to teach you to consider and THINK that YOU SHOULD BE IN FULL CONTROL OF YOUR AIRPLANE AT ALL TIMES! Because when it all boils down to survival, it will be ONLY YOU who can make the difference between SUCCESS and Bent Metal!